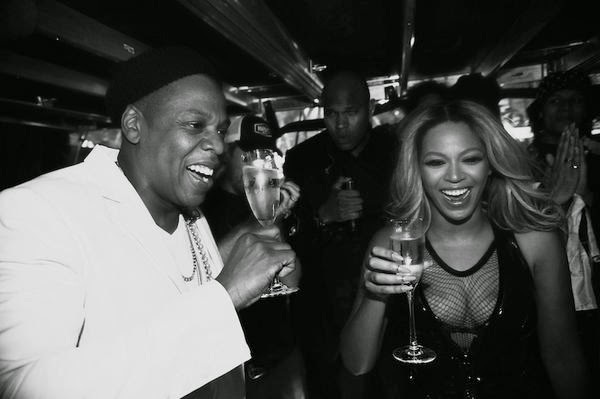 They wrapped their On The Run tour over the weekend in Paris and celebrated in style. And despite Jay Z recently hinting that his wife Beyonce Knowles was pregnant with their second child, the 33-year-old singer was spotted drinking a glass of champagne as a well deserved reward after their well-received performances. In a photograph posted on the Twitter page of Jay Z's Life + Times - a digital experience covering art, sports, music, fashion and culture - Beyonce can be seen wearing a cleavage baring netted outfit as she triumphantly holds up a glass of bubbly. Her huge smile is matched only by her husband's as he too holds a glass of champagne aloft. Fans can be forgiven for being confused as a source told the New York Post's Page Six, 'After the Friday concert, there was no congratulations for Jay and B backstage, there was no indication of a baby announcement. Beyonce and Jay Z welcomed their only child, Blue Ivy, in January 2012. Meanwhile, the couple continued to celebrate with a date night on Monday at the iconic Le Jules Verne restaurant, situated inside the Eiffel Tower. The superstar couple were seen walking arm-in-arm in the City Of Love, with Queen Bey, 33, showing off her feminine curves in a skintight mini-dress, and Jay the romantic gifting his lady love with a single red rose. Beyonce seemed in good spirits, flashing a wide grin for the cameras as she walked alongside her 44- year-old husband. She looked gorgeous in a patterned grey-and-black dress paired with trendy black booties. The singer wore her highlighted blonde hair in loose curls and sported crimson lips. Jay Z, meanwhile, wore baggy black trousers, a charcoal-coloured sweater and white high-tops for the outing. The rapper kept a protective arm over his wife as they made their way out of the swanky restaurant, which boats some of the best views of the city. Earlier in the day, Beyonce and Jay Z were spotted leaving a video studio in France after releasing the first installment of their Bang Bang music video. The couple looked to be in full business mode, as Bey wore a pin stripe suit and glamorous sunglasses for the outing. In the new video, Jay Z proved he was still Crazy In Love with wife Beyoncé by tenderly kissing her neck in the first part of their Bang Bang trilogy on storytelling site Nowness. They stop at a diner where Beyoncé rocks Brigitte Bardot-style locks and her beau born Shawn Carter - puffs on a cigar before putting it out on a man's hamburger. Bey and Jay - who have amassed a combined 36 Grammys - also playfully peek at each other through her coiled-up paper telescope. The couple were photographed Sunday afternoon bringing their two-year-old daughter to NoLita restaurant on Champs Elysées avenue.